These new cars are just made out of plastic. These new cars fall apart in a crash. Give me a nice solid metal car, like the ones I grew up with. 40 miles per hour – metal vs. plastic – which one do you want to be in? Both cars have engines, so don’t pretend otherwise. Yes, the new car is a wreck after the crash, but so is the solid metal car. The heavier solid metal car is even more of a wreck. The new car is designed to deform and absorb the impact, so that the occupants have fewer injuries and so that any injuries are less severe. The fiction of good old solid metal. The reality of improved technology. Oh, but the Bel Air is 50 years old! Then find a brand new 1959 Bel Air to crash and see if that does any better. Any 1959 Bel Air on the road is over 50 years old, so you should be very, very careful if you drive in one. The safe old metal car is a myth. Crash avoidance is also much better on the newer vehicles. Crash avoidance is much more important on all vehicles. 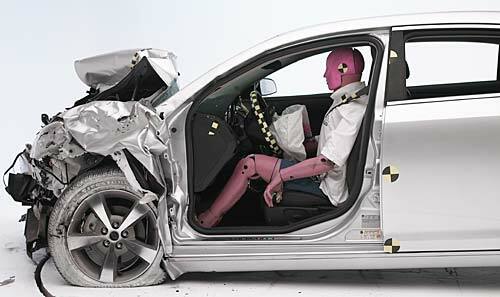 Six air bags are also now standard: two dual-stage front bags, two side-impact curtain air bags protecting the heads of both front and rear passengers, and two side-impact thorax bags mounted in the front seats. Traction control, electronic tire pressure monitoring system, four wheel disc brakes, antilock brakes, and daytime running lamps are now all standard included safety features on all Malibus. GM’s StabiliTrak brand electronic stability control is standard on all models including the very base LS model. I’d like to see them try that with a much newer solid metal car. For example 20 years old. OK. Early 90s Volvo 940 GLE vs. mid-2000s Renault Modus at 40 MPH. The Modus is the first supermini (subcompact) to receive a 5 Star rating from Euro NCAP. Again, both cars have engines, so don’t pretend otherwise. The Volvo 940 is supposed to have at least a driver’s side airbag, but none deploys. Is it a malfunction? Was it disabled at some point in its life? 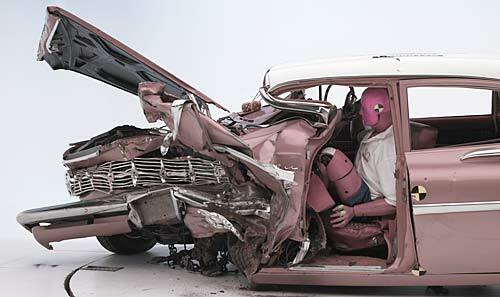 They do not mention any examination of the Volvo for airbag problems. Should we expect reliability from a 15 to 20 year old airbag? The 940s did have recalls for airbag problems. Never mind a 40 MPH offset crash. What about 60 MPH? Even good safety equipment cannot protect us from everything. Newer cars are designed to be safer. Newer cars are more reliable. Newer cars last longer. Newer cars have better fuel economy. Newer cars pollute less. We get a lot more for the same amount of money, but some people prefer to imagine that the good old days were better. Maybe I shouldn’t wake them from their fantasies. Whereas five people were killed per 100 million vehicle miles traveled in 1960, that number had plunged by nearly 75% to 1.36 fatalities per 100 million vehicle miles traveled in 2008. Put differently and in the terms where the rubber literally meets the road, it’s four times safer to be on America’s highways and bi-ways today than it was a half century ago despite a quadrupling in the number of vehicles on the road and a 10-fold increase in miles driven. Part of that may be due to EMS, but this makes it pretty clear that just going by Mechanism Of Injury is not a concept that considers patient assessment. Oooh! Look at all of that front end damage! The front end is destroyed on all of these cars. The newer cars were designed to sacrifice the front end to protect the occupants, while the older cars were designed with less consideration of the occupants. The cars behave pretty much as designed. Some protect the occupants and some do not. Does the exterior damage tell us anything about the injuries? So why do doctors worry more about the damage to the cars, than they worry about the damage to the occupants? Finally, what about 120 MPH into an immovable object? Humpty Dumpty drove too fast. A supermini is a British term that describes automobiles larger than a city car but smaller than a small family car. This car class is also known as the B-segment across Europe, and as subcompact in North America. 1991-93: If car has been subjected to flood conditions, attempting to start the engine could cause airbag deployment. 1995: Driver-side airbag may not deploy properly in a collision. The median and mean age of automobiles has steadily increased since 1969. In 2007 the overall median age for automobiles was 9.2 years, a significant increase over 1990 when the median age of vehicles in operation in the US was 6.5 years and 1969 when the mean age for automobiles was 5.1 years. I like to hear the ‘myth’ of the old reliable cars of the old days. Of course, they look cool (a 1957 Chevy Bel Air looks way better than a 2011 Chevy Impala, but I digress). My 2000 Chevy Silverado has been the absolute best vehicle I have ever owned. 280k miles and I have spent a little under $1k in repairs (that is a little over $90 a year). Not bad. And I remember the wrecks I used to go to in the 70s and 80s involving the old land yachts. When we extricated pinned in patients, they were usually dead or soon to be. We also needed the big Hurst 32B Jaws that required two people to use…with the little Kawasaki motor in the background…bawap, bawap, bawap. Now, more often than not, they are walking around when we get there. And that is after they have rolled the vehicle or struck some other unmovable object. So much for ‘mechanism’ being the absolute predictor of injury. Of course, I know of places where they will fly-out a person who was in a roll-over, even though they were out walking around when EMS arrived. Of course, most of the folks that praise the safety of the older vehicles also bemoan the use of seatbelts, saying things like “I would rather be thrown clear of the wreck”. And helicopters and MAST save lives. Yep…you just can’t make stuff like that up. Another myth is “American made.” Just because it has a foreign brand name does not mean that it is not made in the US. It was harder to get patients out, because the cars were wrapped around the patients, but that does not mean that the cars were protecting the patients. Even calling medical command at the local “Best Hospital in the World” for permission to transport to the local hospital when the patient has absolutely no injuries can result in orders to fly the patient. There is no accounting for stupidity. They watch too many TV shows and movies, where the car always bursts into flames just as the person is far enough away to survive. The more scary thing is that these idiots vote. You could make it up, but nobody would believe it. When I sideswiped my ’91 Honda Prelude on a highway concrete divider, I ended up with a bit tongue and a sore neck for a few days. That Bel-Air driver? Looks like he’s biting his own kneecaps. Kneecaps are tasty – especially with all of that ketchup! The side that was on the ground? I did the same thing with a convertible. Fortunately, nobody called EMS, or they would have been trying to fly me. Some bystanders helped to push the car back onto its wheels and after letting the oil settle back into the places oil is supposed to be, I drove away. I sometimes miss my first car. I could fix everything myself, but I did have to fix a lot of things. My current car is reliable in a way that I could not have imagined when I was working on that old car. My first car did get me through my first few years of driving, but only because I was very lucky. Wait, are you saying MOI doesn’t have a correlation to actually injuries suffered? But, but, PHTLS and BTLS(ITLS, whatever) swear they’re interrelated. They wouldn’t lie, would they? Especially since they’re so smart they use “kinematics”, right? Wait, are you saying MOI doesn’t have a correlation to actually injuries suffered? Mechanism probably does have a real correlation to actual injuries suffered, but it is too complicated for us to understand. We have to imagine what the mechanisms are because we almost never witness what happened. Even if we did witness the event, would we understand what is relevant? No. We would still only be guessing. But, but, PHTLS and BTLS(ITLS, whatever) swear they’re interrelated. They are interrelated, but that does not mean that we are smart enough to understand. We are stupid enough to pretend that we understand. They wouldn’t lie, would they? Especially since they’re so smart they use “kinematics”, right? I don’t know how many of them believe what they are shoveling, but they lay it on thick and they don’t stop. When the only tool we have is a fraud, we don’t admit that it is a fraud. That is our scepter of power, just as with any ruler claiming divine right. We depend on people believing in magic. We are not smart enough to figure out what is real. We kill our patients with ignorance, rather than learn from our mistakes. But the new cars are not made of plastic, that is just decorative trim. The passenger compartments are made of the strongest steel ever – it’s called Ultra High Strength Steel. It has 110,000 pounds per square inch of tensile strength. All the old cars are made of mild steel, only 35,000 pounds per square inch tensile strength. So the new car steel is 3 times stronger. The fact that the old car steel is slightly thicker means nothing, since it is softer and more bendable. But the new cars are not made of plastic, that is just decorative trim. Exactly. That is what a lot of people do not understand. We are overly impressed with the superficial. We do not understand what is significant. The passenger compartments are made of the strongest steel ever – it’s called Ultra High Strength Steel. It has 110,000 pounds per square inch of tensile strength. All the old cars are made of mild steel, only 35,000 pounds per square inch tensile strength. So the new car steel is 3 times stronger. The fact that the old car steel is slightly thicker means nothing, since it is softer and more bendable. But that is part of the superficial evidence that so many people depend on – it looks stronger. The devil is in the details, and no one has the attention span to listen to them. And once they posted wrong or ignorant information on the internet, they have to save face, they cannot suddenly back down and say that they did not know that, and thanks for the info, or worse, actaully ask a question to become more informed. Instead they make up more outlandish excuses why what they are seeing is not true, and how it is all rigged, with ever increasing expletives and anger. I don’t believe there was any good old generation that thought through things more logically than we do now. That is normal human behavior. We have been that way as long as we could communicate. Now, we just have more evidence, because more is available to see on the internet. Fanatics, denialists, conspiracy theorists have always been with us. The internet just makes it easier for us to find similarly biased people to reinforce our biases.